We list our most popular products for over 800 vehicles. We have products for over 2400 vehicles. If your vehicle is not listed, it does not mean that we do not have profiles and parts available for it. Please contact us if you do not see what you are looking for! Our nickel based hard facing alloys are homogeneous materials containing complex microscopic bi- and tri-metallics. These weld overlays greatly enhance the erosion and abrasion resistance of our hard welded parts. In addition, they offer very high thermal fatigue resistance. During our welding process a metallurgical bond is achieved with the substrate. The overlay’s natural lubricity and their resistance to galling coupled with low RMS finishes mean less wear on both our cams and your mating surfaces. We are constantly designing new profiles for new applications, so if you want up to the minute information please don't hesitate to call us directly, we are here to help you. Our web site lists our most popular products and services. Many of our products have helped racers win national championships and set national and world records. The top professionals have put their trust in our constant research and development program that includes race track and dyno testing. 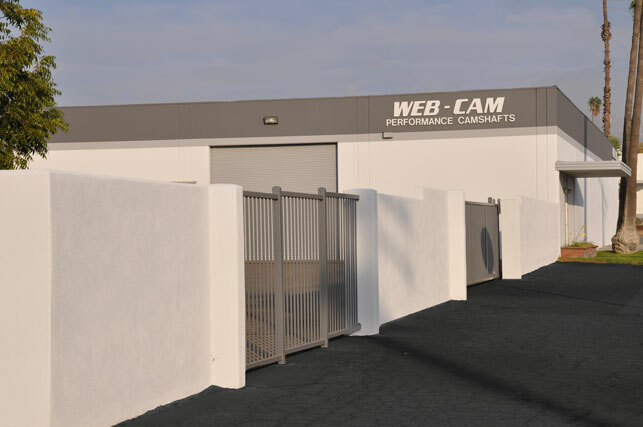 The entire crew at WEB-CAM has a dedication to top quality workmanship and reflects the owners dedication to quality, performance and innovation. Over the years, WEB-CAM has developed, ground and carefully stored many master cams dating as far back as the early 1900's. With this extensive collection of originals, combined with the many years of experience working with them, WEB-CAM has become the natural choice of antique restorers worldwide for their camshaft work. WEB-CAM offers one of the largest selections of import auto, ATV and motorcycle camshaft services available. Listed in this site are our most popular applications. If your application is not listed here, please contact us, we can probably help you. Stock and high performance profiles are available. Sorry, Technical Support Is Not Available Via E-Mail, Please Call And Speak With A Representative.